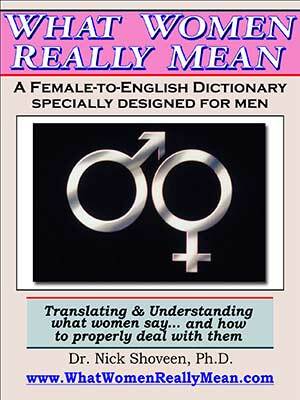 Unlike many other books that merely provide male definitions for a list of words and phrases like 'fine,' and 'if that's what you really want,' Doctor Shoveen goes behind the words that women use, to reveal the hidden meanings, their thought processes, and how an alert male can use these utterances as a form of verbal ju-jitsu, absorbing their force, and turning them back towards the female. Successful use of the Shoveen method of verbal self-defense levels the playing field and gives men a chance to survive in a relationship. It can also assist in molding female behavior into a palatable form that is more easily tolerated. Notwithstanding numerous attempts by feminist groups to stop his writings from being distributed, Magic Lamp Press has bravely gone where no other publisher has gone before. Now, for the first time, men of the world can unite behind Doctor Shoveen's proven method for dealing with the feminine mindset. Opinions and theories in this book are entirely those of Doctor Nick Shoveen, and do not necessarily represent those of the publisher, Magic Lamp Press, or translator Gene Grossman. The purchase and reading of this publication will be understood as a waiver of any and all liability for physical and/or mental injuries sustained while attempting to utilize the advice given in the book.